When Charlie Opper acquired a few acres in the beautiful Capay Valley northwest of Sacramento, he needed to figure out what to do with the place. 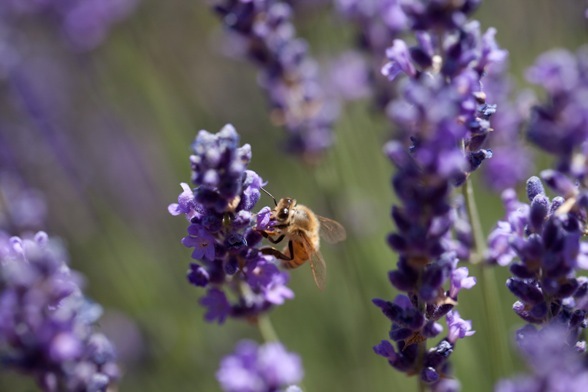 To the gratitude of hundreds of Menlo Park Farmers Market attendees every Sunday, he chose to create a lavender farm. The Cache Creek Lavender Farm booth is where Charlie and his partner, Linda Barrett, share the products of their labor. Charlie and Linda chose lavender as an ideal product to raise in the Mediterranean climate of their farm near Rumsey, CA. Asked what attracted them to lavender, Charlie rattles off a long list that includes aroma therapy, sleep aid, antibiotic, anti-viral, burn remedy, and scar reduction. But the thing most people love is the fragrance, which seems to relax and create a pleasant mood. After getting the farm up and running, they were looking for an outlet for their products. Farmers markets seemed like a logical choice. Charlie says there is lots to like about the Menlo Park Farmers Market: “The market is really quaint. We have a very regular clientele and we are surrounded with very high quality vendors.” He also likes the demographic mix, which he says features students, seniors and dot-commers. Charlie grew up in Southern California. He took his love of surfing to Hawaii for 20 years. He met Linda in nearby Woodland, soon after moving to the farm in Rumsey. Linda grew up in Boston and came west to go to school at Davis, where she studied plant and soil sciences. Now that the farm is up and running, they have a lovely shop on the premises and host an annual lavender festival the second week of June each year. The festival is well attended by hundreds of people from all over the state. It features lavender ice cream, wine, crafts, music and this year a wood-fired pizza oven.